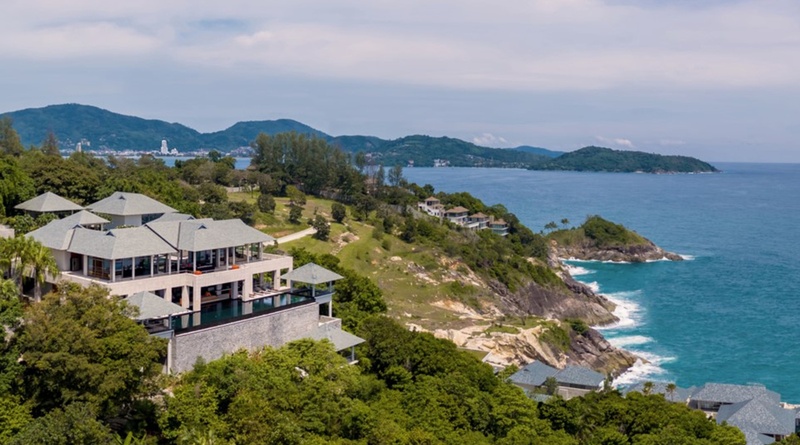 Baan Paa Talee Estate on Phuket’s exclusive Cape Amarin is as adaptable as it is spectacular. It offers seven- and nine-bedroom options and can sleep up to 20 guests. The extraordinary ocean views are maximised from every room and from an impressive array of relaxing, sea-breeze-cooled outdoor spaces. Palm trees, frangipani and swathes of fiery ginger create an exotic tropical haven at this dramatic cliff-side villa, where water features gently echo the song of the ocean. Baan Paa Talee Estate’s nine bedrooms are arranged over four spacious levels. Rooms are thoughtfully positioned – some in splendid isolation and others in convenient two’s and three’s, ideal for families. But common to all rooms are first-class facilities, top-quality furnishing and finishes, sublimely comfortable king-size beds and large, luxurious bathrooms. The self-contained two-bedroomed Ocean Villa, which lies in perfect privacy closest to the water’s edge, makes a romantic hideaway for honeymooning couples and a magical ‘tree sala’ provides an enchanting setting for wedding vows. A dining room seating 20, gleaming guest kitchen, relaxed sitting room and open-air reception lounge crown Baan Paa Talee Estate’s living areas. Below is the villa’s ‘chill out’ zone where a 25-metre infinity pool melts into the ocean, capped at one end by a dining pavilion with sunken seating and at the other by a shaded jacuzzi. Sun loungers flank the pool and a bar, pool table and more comfy seating beckon for relaxed days in the sun. Also on this level is an air-conditioned media room for when it’s time to cool down with a favourite movie. The villa is expertly staffed with a team who cater to every request with friendly efficiency. The chef’s skill and creativity is evident in every dish she presents, making Baan Paa Talee Estate a dream for those wishing to explore Thai cuisine. Baan Paa Talee Estate lies between laid-back Kamala and party-town Patong on Phuket’s west coast, but once through the doors of the villa, guests may well find that any ambitions to venture further afield just melt away.